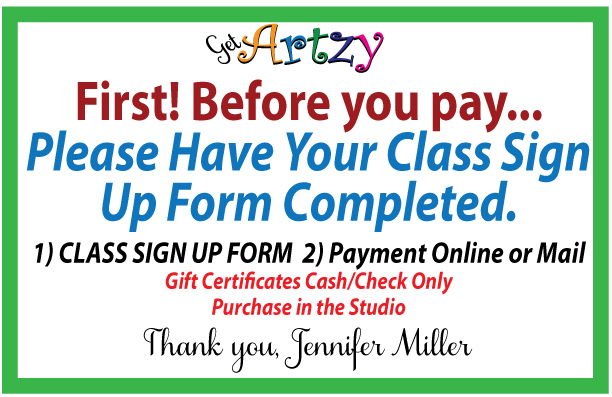 Mail to Get Artzy, 34610 Spring Prairie Road, Burlington, WI 53105 DIFFERENT PAYMENT OPTIONS- MAKE SURE TO SCROLL DOWN TO FIND WHAT WORKS FOR YOU. POLICY – If a class has to cancel or moves to another date – you will get a credit form via email from me. You MUST have the form to use your credits. All credits MUST be used within 1 year. Group Party Deposit is $210 This is for a group that picks the date and theme but does not have 10 people (min. 6 people). I will add others to your group – public. Please call or email first to check if the date is still available. Available dates change daily. PRIVATE! Private Groups – $350 – Please call or email first to check if the date is still available. Available dates change daily. This is if you want to reserve for a private party. You must have 10 people min. up to 16 maximum. PLEASE INDICATE on PAYPAL – INSTRUCTIONS TO MERCHANT SPACE – WHAT CLASS PAYMENT IS FOR. MAKE SURE YOU GET A EMAIL STATING THAT YOUR SIGN UP WAS RECEIVED. This may take 8-12 hours. I reply personally to all sign ups. 🙂 If you do not get a response email, please call ahead of class to make sure class is still on. Please do sign up form along with payment. Please indicate in notes which class payment is for. NOTE: ALL PAYMENTS/DEPOSITS ARE NON-REFUNDABLE – YOU CAN ONLY USE AS CREDITS; There will be a $35 charge for any checks that are returned, or any other insufficient funds. KIDS —NOTE: NO FOOD OR TREATS can be brought in for KIDS CLASS! ADULT NOTE: ADULT CLASS ONLY -If you are bringing food keep it simple to : crackers, cheese and grapes. More food will be an additional cost of $50 group time.